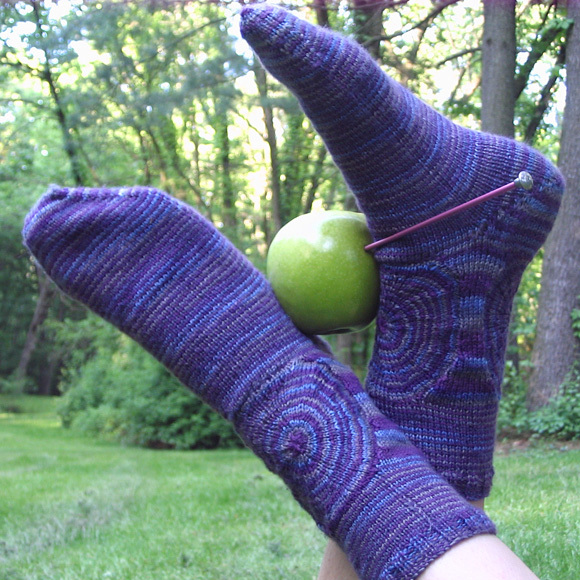 A fun and uniquely constructed sock pattern. At one point, it resembles an ankle thong. Later stitches will be picked up to knit two targets, one in the front and one in the back of the sock for interest from every view. I created this pattern to showcase all the beautiful handpainted sock yarns available today. I am not sure if it is the fun of knitting this sock but it seems to take half the time to finish as most other socks I have knit! Entertaining to knit and even more entertaining to wear! Right on target, if I do say so myself. M1: Use the raised inc for side leg, section 3. With the right needle, pick up the stitch below the next stitch on the left needle. Place it on the left needle, then knit into it. 1 stitch has been increased. Slp: All sts should be slipped purlwise with yarn in front unless otherwise stated. On knit rows: when you come to wrapped stitch, pick up wrap at base of stitch with right needle as if to knit, and knit it together with the stitch it wrapped. On purl rows: when you come to wrapped stitch, slp main stitch from left needle to right needle. Pick up wrap at the base with right needle as if to purl and place on left needle. Slip main stitch back to left needle and purl this stitch and the wrap together. Cast on 20 stitches using Judy’s Magic Cast On. 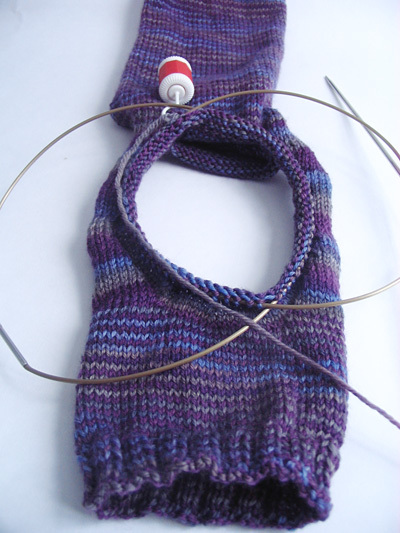 Place 10 sts on each of the two needles, and join for working in the round, being careful not to twist. Next round: Knit all sts. 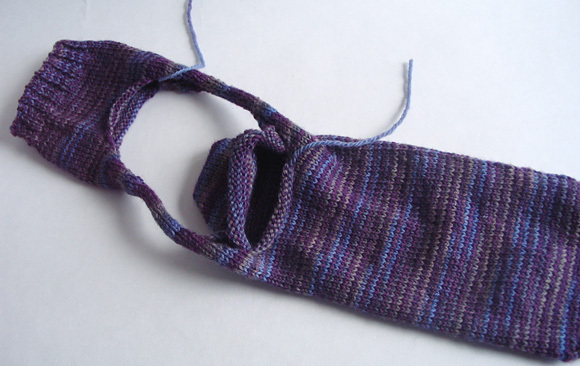 Work even in stockinette as established until foot measures 7.75 inches from cast-on edge. The stitches on needle #1 will be used for the instep. The 32 stitches on needle #2 will be used for the sole. Knit to the end of needle #1 and leave these 32 stitches to rest while you work the heel on needle #2. Row 1 [RS]: K31, wrap next stitches as follows: Bring yarn to front of work as if to purl, slp1, take yarn to back of work as if to knit. Turn work so that purl side is facing. Row 2 [WS]: Slp wrapped stitch, p30, slp 1. Turn work so knit side is facing. Row 3 [RS]: Bring yarn to front of work as if to purl, slp 1, bring yarn to back of work as if to knit (there is now 1 wrapped stitch on either end of row), k29, wrap next stitch as you did in row 1, turn work so purl side is facing. Row 4 [WS]: Slp wrapped stitch, p28, slp 1, turn. Row 5 [RS]: Wrap and slp wrapped stitch. There are now 2 wrapped stitches at either end of row. ), k27, wrap next stitch as you did in row 1, turn work. Row 6 [WS]: Slp wrapped stitch, p26, slp1, turn. Row 7 [RS]: Wrap and slp wrapped stitch, k25, wrap next stitch, turn. Row 8 [WS]: Slp wrapped stitch, p24, slp1, turn. Row 9 [RS]: Wrap and slp wrapped stitch, k23, wrap next stitch, turn. Row 10 [WS]: Slp wrapped stitch, p22, slp1, turn. Row 11 [RS]: Wrap and slp wrapped stitch, k21, wrap next stitch, turn. Row 12 [WS]: Slp wrapped stitch, p20, slp1,turn. Row 13 [RS]: Wrap and slp wrapped stitch, k19, wrap next stitch, turn. Row 14 [WS]: Slp wrapped stitch, p18, slp1, turn. Row 15 [RS]: Wrap and slp wrapped stitch, k17, wrap next stitch, turn. Row 16 [WS]: Slp wrapped stitch, p16, slp1, turn. Row 17 [RS]: Wrap and slp wrapped stitch. k15, wrap next stitch, turn. Row 18 [WS]: Slp wrapped stitch, p14, slp1, turn. Row 19 [RS]: Wrap and slp wrapped stitch, k13, wrap next stitch, turn. Row 20 [WS]: Slp wrapped stitch, p12, slp1, turn. Row 21 [RS]: Wrap and slp wrapped stitch to complete decrease section. There are now 10 wrapped stitches at either end of row, and 12 unwrapped in the middle -- 32 sts total. Row 1 [RS]: K 12 stitches. K the next stitch together with its wrap, turn. Row 2 [WS]: Slp 1, p12, p next st together with its wrap. Turn. Row 3 [RS]: Slp 1, k13, k next st together with wrap. Turn. Row 4 [WS]: Slp1, p14, p next st together with wrap. Turn. Row 5 [RS]: Slp 1, k15, k next stitch together with wrap, turn. Row 6 [WS]: Slp 1, p16, p next stitch together with wrap, turn. Row 7 [RS]: Slp 1, k17, k next stitch together with wrap, turn. Row 8 [WS]: Slp 1, p18, p next stitch together with wrap, turn. Row 9 [RS]: Slp 1, k19, k next stitch together with wrap, turn. Row 10 [WS]: Slp 1, p20, p next stitch together with wrap, turn. Row 11 [RS]: Slp 1, k21, k next stitch together with wrap, turn. Row 12 [WS]: Slp 1, p22, p next stitch together with wrap, turn. Row 13 [RS]: Slp 1, k23, k next stitch together with wrap, turn. Row 14 [WS]: Slp 1, p24, p next stitch together with wrap, turn. Row 15 [RS]: Slp 1, k25, k next stitch together with wrap, turn. Row 16 [WS]: Slp 1, p26, p next stitch together with wrap, turn. Row 17 [RS]: Slp 1, k27, k next stitch together with wrap, turn. Row 18 [WS]: Slp 1, p28, p next stitch together with wrap, turn. Row 19 [RS]: Slp 1, k29, k next stitch together with wrap, turn. Row 20 [WS]: Slp 1, p30, p next stitch together with wrap. 32 stitches. Knit back across all 32 sts on needle #2. Knit 2 rnds across all 64 sts on both needles. Continue to work on needle #1 and needle #2. Next row [RS]: K all sts of needle 1, K8 on needle #2, turn work. Following row [WS]: Slp 1, p15 (7 on needle #2 and 8 on needle #1). Place a removable marker at each end of these 16 stitches. You may wish to rearrange your sts so that these 16 are one one needle, and the remaining are on the second. If you do this, ensure you have a marker placed to indicate the beginning of the round. The sides of leg are each worked back and forth on these 16 stitches in 3 separate sections. Row 1 [RS]: Slp1, k2tog, knit to last 3 stitches, SSK, k1. Row 2 [WS]: Slp1, p across all stitches. Row 3 [RS]: Slp1, k across all stitches. Row 4 [WS]: Slp1, p across all stitches. Row 5 [RS]: Slp1, K2tog, knit to last 3 stitches, SSK, k1. Row 6 [WS]: Slp1, p across all stitches. Row 7 [RS]: Slp1, k across all stitches. Row 8 [WS]: Slp1, p across all stitches. Row 10 [WS]: Slp1, p across all stitches. Row 11 [RS]: Slp1, k across all stitches. Row 12 [WS]: Slp1, p across all stitches. Row 13 [RS]: Slp1, K2tog, knit to last 3 stitches, SSK, k1. Row 14 [RS]: Slp1, p across all stitches. Row 15 [RS]: Slp1, k across all stitches. Row 16 [WS]: Slp1, p across all stitches. Row 1 [RS]: Slp1, k7. Row 2 [WS]: Slp1, p7. Repeat these 2 rounds 7 more times. Place removable stitch marker at each end of last row. Row 1 [RS]: Slp1, m1, k to last 2 stitches, m1, k2. Row 2 [WS]: Slp1, p across. Row 3 [RS]: Slp1, k across. Row 4 [WS]: Slp1, p across. Row 5 [RS]: Slp1, m1, k to last 2 stitches, m1, k2. Row 6 [WS]: Slp1, p across. Row 8 [WS]: Slp1, p across. Row 9 [RS]: Slp1, m1, k to last 2 stitches, m1, k2. Row 10 [WS]: Sp1, p across. Row 11 [RS]: Slp1, k across. Row 12 [WS]:Slp1, p across. Row 13 [RS]: Slp1, m1, k to last 2 stitches, m1, k2. Row 14 [RS]: Slp1, p across. Row 15 [RS]: Slp1, k across. Row 16 [WS]: Slp1, p across. Place removable stitch marker at each end of last row. These 16 stitches will now rest on this needle while you knit the other side of leg. Go back down to beginning of leg. 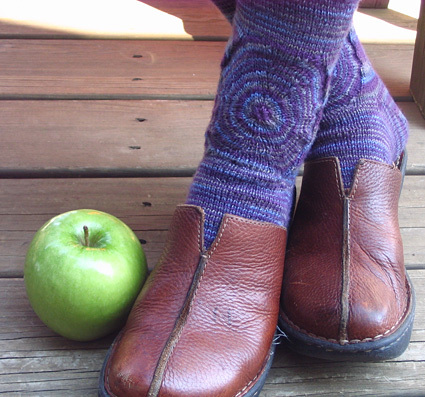 Hold sock with right side of heel facing you. Using needle #1, join new yarn at the bottom left corner of the side you just completed. Following row [WS]: Purl BO 16 stitches, p across remaining stitches. Work second side as per the first side of the leg, beginning with Section 1. RS will be facing when you are done. Next row [RS]: K across 16 stitches at the top of side 2, cast on 16 stitches using the backwards loop method. K 16 sts at top of side 1, cast on another 16 stitches using the backwards loop method. Join the round, making sure sts are not twisted, and the wrong sides are facing each other. Place marker to indicate beginning of round. 64 sts total. You are now set up to resume knitting in rounds using both circular needles. Redistribute sts as necessary. K every round until work measures 2 inches from where you rejoined the round. Next round: [K2, p2] to end. Repeat the above round until ribbing measures 1 inch. Bind off using sewn bind off for elasticity. Hold sock with toe facing you. Join new yarn at at bottom right corner where you have placed a removable stitch marker. With the first needle, pick up and knit 16 stitches between this first marker and the next marker. Pick up and knit another 16 stitches between pairs of stitch markers until you are halfway around the edge, and you have 64 stitches on this needle. With second needle, beginning at top left corner marker, pick up and knit 16 stitches between pairs of markers until you have reached the other needle, and you 64 stitches on this needle. You should have made a complete circle and be back where you started at the bottom right corner, with 128 sts total, divided evenly between the two needles. All decreases should be randomly place for rounder-edged, more evenly shaped target. If you place the decreases consistently, you will get more of a pinwheel shape, with straight edges. Thread yarn through remaining 12 stitches, pull tight to close and secure. Repeat for target on back of sock. 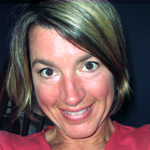 Kellie is “spinning out of control and loving it” as she likes to say, in Lancaster, Pennsylvania. While raising 2 awesome teens, and running a small handpainted/handspun yarn/fiber business, she attempts to squeeze in her original fiber love, knitting, all made possible by her most loving and supportive husband. She can be reached at whorledpeace.com. Whorled Peace yarns are available on Etsy and also at the Lancaster Yarn Shop.